We are funding the academic headquarters for anti-Israel incitement [Middle East Studies programs]. Launched in 2015, Maccabee Task Force is doubling its footprint this academic year in the campus battle against BDS. MTF executive director David Brog outlines a detailed, four-pronged strategy to do so. In the wake of recent controversies involving the disruption and canceling of campus events, many university leaders have adopted the University of Chicago’s statement on freedom of speech—a statement that has become the gold standard on free speech for universities across the country. 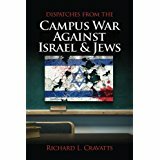 The war against BDS on campus will change when one student in one university decides that it’s time to stop this madness, go on the offensive and put BDS on trial instead of Israel. One of the greatest threats to academic freedom in the United States today is the Boycott, Divestment, Sanctions (BDS) movement, an international political effort designed to undermine economic and cultural exchange with the state of Israel. [….] Anti-Israel groups have attempted to pressure boards of trustees into taking a side in the Israel-Palestine dispute and shutting down relations with Israeli institutions, in violation of their institutional neutrality and responsibility to maintain academic freedom. [T]his essay provides recommendations for actions trustees can take to protect academic freedom and individual rights, safeguard their institutional neutrality, and create a strong campus culture with diverse viewpoints. Academics counter ‘Orwellian’ linkage of Israel protests with other progressive issues. BDS challenges not only Israeli policies, but also its legitimacy and right to exist. Doubtless, some Israeli policies aggravate and exacerbate the situation. But at bottom, BDS seeks demolition of the Jewish state and not reform of its policies. [….] The objective is delegitimization. The goal: not better policy, but no polity. The BDS narrative also often strays into anti-Semitism. Jews are portrayed as privileged, powerful, rich and politically nefarious. They have too much influence with Congress, state legislatures, media, corporate sector and nonprofits. [BDS resolutions] this year increased in both reach and intensity, appearing at a greater number of institutions and with a relentlessness that we had not seen before. Considering the absence of comparable calls to boycott the world’s most egregious human rights violators, there is clearly a double standard at work in such campaigns. Delegitimization also plays a central role, as activists within Students for Justice in Palestine – the driving force behind the BDS movement – sing songs about a Palestine that reaches from sea to sea, leaving no room for a Jewish state. So too does demonization, with routine comparisons of Israel to Nazi Germany and the use of Holocaust symbols to characterize its behavior. When you go visit a college, ask to meet with the admissions staff, the Hillel director, the dean in charge of student affairs, or any other university official you can access. 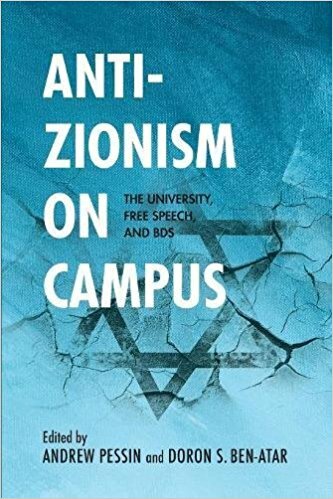 A first-hand account of how one of America’s elite schools became the latest flash point of anti-Israel activism and anti-Semitic intimidation. BJPA Reader’s Guide: Jewish College Students, Berman Jewish Policy Archive at NYU Wagner, January 2012: A selection of resources on the topic of Jewish college students.